Collin Hansen: All of history hangs on Jesus. It’s hard to argue that view, even if you don’t believe him. He and his message 2,000 years ago changed the world. But do we know the real Jesus? Do we know what he actually preached or are we chasing a shadow, an invention of later generations? In short, can we trust the Gospels? That’s the question posed in the title of a new book by Peter Jay Williams, Principal of Tyndale House, Cambridge, which is one of the world’s leading Institute’s for Biblical research. My guest in the “Gospel Coalition Podcast” is the chair of the International Greek New Testament Project and a member of the ESV Translation Oversight Committee. Williams and I will assess the best arguments against the reliability of the Gospels and seek to account for Christian faith in Jesus as portrayed by Matthew, Mark, Luke, and John. Dr. Williams, thank you for joining me on the Gospel Coalition Podcast. Peter Williams: Great to be with you. Hansen: Well, help us understand a little bit more of your argument behind the geographical distribution of early Christian beliefs. This was what I think was one of the most compelling arguments in your in short book here, which I think works really well and accessibly for a wide audience. We live today in an era of immediate ubiquitous communication. But let’s go back 2,000 years ago. If somebody had wanted to invent the Gospels and spread that message broadly in the second century or later, how would he do it? Williams: Well, I think it’d be very difficult. And I think one of the things we see is that Christianity seems to spread far and fast. It’s not just the Christian sources that say this, but also the non-Christian sources, testers and plenty. And the suggestion is, from all the evidence we have, is that Christianity is really spread over thousands of miles across the Roman Empire. Now that means that if you did want to change anything in the Christian faith after it had begun, it becomes quite logistically difficult because, of course, travel is expensive and it’s slow. So in fact, we need to recognize that there’s not an easy way of getting major innovations into the Christian message when it gets really widespread, not in a systematic way. Of course, you can change one group in one place believes. But changing what everyone believes everywhere is going to be very, very hard, unless you’ve got an absolutely huge budget and a huge team to do that. And even then, there’s gonna be lots of resistance to that sort of change. So I think seeing just how Christianity goes out over a wide area means that the best way to explain beliefs is to say that they’re there at the beginning. And if the beliefs aren’t there at the beginning of Christianity, you also raise a question. How on Earth does something spread? I mean, it’s gotta have some beliefs in order to spread. So I think for me this idea that Christianity had major innovations to its central beliefs after been spreading for many decades doesn’t make a lot of sense. Hansen: So let’s say a critic hears that and says, “Okay, well maybe those beliefs were changed. Jesus never really claimed to be all these things. But they were changed at an earlier time before they spread.” There are other problems with that view. Help us to understand some of the problems with that view. Williams: Well, I mean, when… if we’re really talking about the first, you know, decade or 20 years of say of Christianity, there are people around. There were so many eyewitnesses who would have known Jesus. And they are steeped in the Jewish categories of belief that there is only one God. And it seems that one of the things that Christians are doing is they’re worshiping Christ. They’re treating him as the creator of the world, the judge of the world, things that only the Jewish God could do. And so that to me is suggesting that they are accepting Christ as the Jewish God himself. There is only one God. They can’t gradually over time get a more and more exalted view of him, until they develop the sense of him being God. That doesn’t make sense because within Judaism, there is only ever one God. Hansen: Well, let’s talk specifically again about the Gospels here. There were lots of gospels in that broader category written about Jesus. Help us to understand how they differ from Matthew, Mark, Luke, and John, and why we have come to trust those four and not all these others, which took on the names of any number of other figures, including other people who were purported to have been disciples of Christ? Williams: Well I think that Matthew, Mark, Luke and John are the earliest Gospels. And even a skeptic like Bart Ehrman and many others would say exactly the same. They are earlier than all of the other ones. And I think the other ones are imitations of those Gospels. You can actually see signs of imitation in the way that they write. And so I think that those imitations in a sense show the genuine ones to be genuine. We can see contrast in terms of their knowledge of Judaism, knowledge of the time and place of Jesus, knowledge of geography, that specificity, and also the categories they’re thinking in. They clearly come from the second and third century, the Apocrypha Gospels, and later. And the four gospels come from a much earlier stage than that. Hansen: This is a bit of a summary question. But I want to do this from two different vantage points and kind of summarize I think the overall view. And we’ll get into some of the other specific ones. You mentioned the geography right there a little bit ago. And that was one that really stood out to me, just how much geographic specificity is in there that we have no reason to expect from people who would have been able or that wouldn’t have been possible for people who are writing from a distance without or familiar with that area. But let’s say, we’ve talked about a couple of them already that critics present many poor reasons for why we shouldn’t trust the Gospels. Easy ones to knock down, easy ones to refute. But what would you say is their most compelling argument against the Gospels? Williams: Yeah, the most compelling arguments don’t really come from the skeptics. The most compelling arguments come from people who are Bible readers within the church who are wondering how this and that, you know, two different texts, fit together. They’re wondering, you know, did Jesus throw people out of the temple early in his career or ministry or later on, you know, according to John or the Synoptics. And they’re wondering about Quirinius and when he was governor. But these are questions which are raised within Bible students, rather than necessarily amongst skeptics. I mean, skeptics tend to me not to pose as sharp questions as, you know, children and young Christians who are, you know, studying text seriously. But I think that what we gotta do is with all of these questions, you gotta realize that none of them are defeatist. There aren’t difficulties which are so large in the Gospels that you can’t possibly accept them as true. They’re puzzles to work on. Hansen: You do address those issues of contradictions or supposed contradictions or confusions about timelines and things like that in brief. But what would be another source that you might recommend people to read if they’re interested, especially from the perspective of people who believe this, but are confused, especially upon close reading? Where would you suggest that they turn to learn more on those contradictions, so-called? Williams: Well, I think what they should do is they should be looking at commentaries, good commentary series, and also writers of the past where, you know, there are certain perennial puzzles. For instance, the chronology of Jesus’s Passion Week, was the Last Supper on the night before the crucifixion? Was that a regular Passover meal at the regular Passover time or not? How does that fit with John, who presents Jesus as being crucified while the Passover lambs are being slaughtered? And so those are our questions. And, you know, my issue is not that there are no answers but that there are multiple and possible answers. And I’m not sure which one to go for. So in a sense, the data are undetermined in so many of these cases. So I think that, you know, talking to all the questions and reading books is the way to deal with things but also to recognize them. There are lots of puzzles in life. And we don’t give up trusting people and give up trusting particular sources of information because there’s something we haven’t yet worked out. I mean, people don’t give up believing in quantum mechanics because there’s something they haven’t yet worked out. That’s actually just normal life, you know. We’re dealing with cultural distance. We’re dealing with multiple sources. And there are various ways these things can be fitted together, as with, say, the resurrection accounts where I think they give plenty of evidence of their independence. But there are…there’s more than one way that they can be fitted together. There are tensions between them. You know, that shouldn’t worry us but it is something to think about. So I didn’t deal with the questions of contradictions and tensions at any length in my book because it’s meant to be very short. But I did say we need to get away from this sort of point scoring exercise you have between the skeptic who poses a question and the believer who is meant to give them a pat answer. And actually believing in this and disbelieving shouldn’t hang on that because, actually, we know that in life there are all sorts of complex things. We’re not asking people only to believe in Jesus, if they have pat answers to everything. We’re actually saying there’s plenty of evidence to believe in Jesus. You can do that very rationally and in a thinking way. But that doesn’t depend on being able to have simple and single answers to problems. What you would hope is that there is not a single defeater. That is, something that, you know, really just can’t possibly be reconciled. So you don’t get to say in the Gospel something where it says that Jesus was born in Egypt at the same time as it says Jesus was born in Bethlehem, you know, in Judea. You don’t get those sorts of things, problems which just couldn’t possibly be reconciled. Hansen: Right. Well, I find that there are a number of different hurdles that you have to jump if you’re coming from the contemporary period with our expectations when you’re looking at the Gospels. Three of them that I would just mention, some of them we’ve already brought. Chronology. It’s not necessarily seen the same way in each of the Gospels nor is it seen in exactly the same way that we look at it today. Selectivity. By necessity, these are selective. These are not exhaustive accounts because they’re used for a particular time in a particular place in a particular audience that is then inspired by the Holy Spirit for our intent and use today, as well. And then another one that I want, would like you to talk about here is quotations. We expect when you see those quotation marks that we are getting the precise wording exactly as it was heard, exactly as it was written. Explain how quotation works, function in the Gospels. Williams: Well, you know, quotation marks are quite a recent thing. So they begin really in the 17th century in English. And if you look at an old King James Version or many older Bibles, they simply don’t have quotation marks at all. And it’s only really in that last 100 years that quotation marks have been introduced in English Bibles. So it’s really a very recent phenomenon. But when you have a quotation mark in our culture, it introduces two expectations. One is that you’re not going to omit any words without a dot, dot dot. And the other one is you’re not going to add any words in without telling people. Now ancient cultures, you know, believed in true and accurate reporting. But they also didn’t have what I would call bounded quotation marks. So they don’t have this idea that I mark the beginning, mark the end, and I’m not allowed to do anything in between, other than represent the exact sequence of words that came out of the person’s mouth. And so what that means is that they can truthfully report without quite the same anxieties that we have. So if I wanted to report, let’s say, 19 out of 20 words that someone said in English, I would have to either put a dot dot dot or end the quotation and start another one or something like that. This is a very hassle-written way of doing things. And they can truthfully report simply omitting a word. And so you get that sort of way of doing things, which is not less truthful. It’s just following their cultural conventions, just as we follow our cultural conventions. And sometimes our cultural conventions are odd. So our unwillingness to… We have this convention that you have to put things within quotation marks, if you’re doing more than a few words at a time. Otherwise, it’s plagiarism. And that’s partly, you know, for economic reasons that we do these sorts of things. We’re keen to guard intellectual property and so on. And that’s why we’re doing it. It’s not because you can’t be truthful without doing that. So what we’ve got to do is we’ve got to remember that the Gospels are truthful. But they are truthful in terms of the conventions that people had for writing at the time. Now, those aren’t radically different in every way. But on the question of quotation, there are some differences. And they need to be looked at so that you can see what’s going on. Hansen: Correct me if I’m wrong here. But this would actually apply to John 3:16, wouldn’t it? Williams: Well, I mean there is a problem. Really since people started doing words in Christ in red at the end of the 19th century and also since they’ve introduced speech marks, that do you say that Jesus’s dialogue with Nicodemus ends at Chapter 3:16 or does it go on further? And this also happens at the end of John 3. How far does John the Baptist’s speech go? Does it go past verse 30 or 33 to 36? And we’ve made a rod for our own back because by introducing speech marks into Bibles, we’ve actually said the translators have to decide. Now ancient translators didn’t have to decide that. In fact, translators at the time of the King James Version and at the time of William Tyndale didn’t have to decide that. But we have to decide it now because of our printing conventions. So there we are. I mean, you know, I think my preference would be for translators not to have to decide that. I mean, we have other similar things with capital letters. I mean, Hebrew doesn’t have capital letters. And in Greek at the time of the New Testament, it’s either all capital or it’s all lowercase, whichever way you look at it. But they have no mix. Like, Chinese doesn’t and Arabic doesn’t. All sorts of languages don’t. But we’ve decided we need to have upper and lower case and that means that every time you come across the Angel of the Lord in the Old Testament, you have to decide whether you use a capital A or not and likewise with spirit and so on. So we’ve made certain rods for our own back. And we should know that we’ve made those rods. And we need to perhaps unthink some of those ways. Hansen: Right. Well, let’s talk about this geographical argument that I alluded to earlier. I was especially impressed with your presentation of this argument in the Gospel accounts. It actually reminded me of studying with Don Carson in his infamously difficult quizzes, which were designed to teach us that no detail in God’s word is extraneous. Well, many of these places that we read about and that you cover in your book have become famous to us, but only because of the Gospels, only because of the life of Jesus. So help us understand why it’s so remarkable what the Gospels tell us about the physical world of Jesus’s life. Williams: Well, the Gospels name a large number of villages and towns. And they can’t all get those from each other because every single one of them has some that the other ones don’t mention. And they can’t get them from other geographical sources like Pliny the Elder or Strabo because none of those sources mentioned quite the ones that we have in the Gospels. So they each seem to be able to be independent sources of information about geography. And it’s not just that they know towns. And, of course, someone, you know, let’s say who’s living in Turkey, Syria, Greece, Italy, isn’t gonna be able to know names of towns or look them up easily, unless they speak to an informant. There are no books they can go to read about all of these sorts of things. But they also know the topography of the land, that is where the land goes up and down, where the water is. They know the traveling distances. They even know where the places you’re going to get taxed en-route are. They’ve got a good idea about the weather, about plants, all sorts of things. So I think that we can make the argument that the Gospel writers are either are familiar with the land because they’ve lived there or they’re familiar with the land because they’ve had very, very detailed conversations with people who live there and have learnt stories and accurately recorded the details of those stories. So you can choose either one of those things. But I think that’s what we learn from the geographical details. Hansen: I had mentioned earlier some of the bad arguments against the Gospels. If I understand you correctly, you would identify the telephone game explanation as one of those bad arguments against the Gospel. Yet nevertheless, I find it to be a very popular one that people repeat as if it’s some kind of defeater. Why is that view lacking in credibility? Williams: Well, we need to think about what the telephone game is. The telephone game is a game with very strict rules. And you have to adhere to the rules in order to optimize the situation to get the message corrupted so that it would be funny. If you don’t optimize a situation, it doesn’t work. So we’ve got to have enough people to play. You can’t just play with three of you. You know, you want to have 10 or 12 or so. And then you’ve got to whisper. And you’ve got to have the rule that you can only say it once. And you’ve got to have the rule that you can only hear it from one person. You know, no one’s allowed to repeat anything. Very strict rules. And that’s in order to maximize the likelihood of corruption. Well, why would I imagine that New Testament communication took place in a context of maximized, optimized corruption? It just doesn’t make any sense at all. So I think, you know, the New Testament is a bit more like karate. I mean, no one gets worried that karate is getting corrupted because it gets taught from one person to another. Everyone knows that there are checks and balances in the way that you teach and so on. So I’d want to say that, you know, from an initial standpoint, we shouldn’t accept it as a good analogy. But secondly, when we look at the information we have in the Gospels, we can see that the Gospels have got right all sorts of incidental details, which would be the very first things to get corrupted, if you had careless corruption. So that means that we shouldn’t accept the idea that we have careless corruption and that things have gone through multiple steps. A couple of arguments about that would be the names. Names are one of the very first things that we forget and because they’re arbitrary labels on the whole. And yet, what we find is the Gospel writers have correctly got the sorts of names that you ought to have in the right proportion for the characters in the Gospels. They also, say with something like the feeding of the 5,000, they get the peripheral details of the miracle very plausible in terms of the greenness of the grass, in terms of the location. All of these things fit. And yet, if you were saying that the story of the miracle arose through careless exaggeration, how would you get a careless exaggeration which kept the insignificant details of the story right? So I think there are various ways you can look at the Gospels and just say that this idea of, you know, things getting passed on carelessly doesn’t really work. Hansen: One of the… I’ll just go ahead and get straight into this one. Simple question, complex answer. What language did Jesus speak? Williams: I think Jesus clearly spoke Aramaic at times when he says, “Talitha koum,” when he says, “Ephphatha,” from the cross, and so on. There are periods when he speaks Aramaic. And I think that would have been the main language for use in Jerusalem. But I think for me, it’s quite plausible that he could have spoken Greek. In fact, when you look at the Sermon on the Mount where it’s recorded, there are people from the Decapolis there. And you get quite a lot of alliteration in Greek in the Beatitudes. I think it’s plausible he can speak Greek. And one of the reasons people have resisted this, I think, is that people have been very influenced by the romantic notion that there’s…that effectively, people at the time were peasants who, you know, really knew nothing, had no sophistication and forget that Greek culture dominated things for several hundred years since Alexander the Great. Many of the leading Jews like Nicodemus had Greek names. Jesus had disciples like Andrew and Phillip with Greek names. And actually, there’s a lot of plausibility to him speaking Greek and people around him speaking Greek. So I would go for majority Aramaic. But I think I particularly want to push against this idea that Jesus’s teaching must have been corrupted because it got changed in translation from Aramaic to Greek. And I think this is a very implausible idea indeed. Hansen: As you point out in the book, Can We Trust the Gospels?, we have 1,000 times the manuscripts that Erasmus had in the 16th century when he published the first edition of the Greek New Testament. So since… I mean, how much has changed in our text of the Gospels since then? Williams: Well, I mean, the answer is not much. Now, of course, we know that there have been debates about the end of Mark and the woman caught in adultery and a few much shorter passages in the New Testament. So, typically these endings are in the King James and the New King James. They’re not in many of the other translations. But if you compare what Erasmus knew about in his time with what we know about now, the answer is that we haven’t had a large growth in uncertainty. As the evidence has increased, we haven’t been finding, oh, there are more and more passages we’re not certain about. In fact, what we’ve been finding is that a pattern of evidence such that we can say if future discoveries or anything like discoveries in the last 500 years, we expect that there will be no new uncertain passages about the New Testament. So Christians can get very upset with each other, if they have, you know, somewhat different texts of the New Testament. But my argument is that we should unite and make a very strong case that we have a huge level of confidence in the New Testament text. There are some things like the first 14 verses of John where Erasmus has exactly the same letters for, you know, those verses as a modern edition has, you know, that we’ve not had to make big changes in the New Testament text. Hansen: It’s kind of amazing how many relatively recent discoveries have been made that have really brought further illumination to the Gospel texts and the New Testament in general. Do you expect any more of those discoveries? I know that’s impossible. But is this something that you and other scholars are actively awaiting or anticipating? Williams: Yeah, so there are certain patterns of discovery. So, you know, in the 19th century, people explored Europe. And they found manuscripts in monasteries, you know, Tischendorf in Mount Mount Sinai, St. Catherine’s and so on. And then in the 20th-century, people dig papaya reed out of the ground. Where I expect discoveries to come to some extent is in Western libraries where things have been forgotten and particularly using technology to read rubbed-out writing. So there’s quite a…there was a time between the 7th and 10th century particularly when there was a real shortage of writing material. And people did have a tendency to rub things out and write things on top. And now with modern imaging techniques, it’s often possible to read the writing that’s been rubbed out. So that’s an area where I expect there will be discoveries. But all of these things simply refine our knowledge. They’re not things which cause a revolution. You know, the New Testament text is very, very stable. I expect that Greek New Testaments printed in the future will not be very radically different in the words or less as they have from ones today. Hansen: There are many very powerful arguments in your book, Can We Trust the Gospels” One of them that I don’t have time to get into now, but I want to encourage people to look at that I’d never really seen before, was how you treat the disambiguation of names. It’s incredible about how, you know, Jesus being a fairly common name and how it would need to be distinguished at an early time in a certain place. But then at later times, he’s become so famous. A very, very fascinating argument there and like I said, many other good ones, as well. But which argument do you personally find most convincing? Williams: I don’t know if I’d want to choose a single one. I think they’ve all got their place and they all, you know, come together. I mean, you know, it’s like asking someone sometimes, you know, their very favorite thing about their wife, you know,. And I think I wouldn’t want to choose. There are so many things. So with the Gospels, I think you’ve got a whole pattern of evidence which converges and where we’re offered, in a sense, a simple solution. The simple solution is it’s true and Jesus is the Son of God. You can make up other explanations. But they’re gonna be way more complex. And so I don’t want to say that skeptics are cornered and they have nowhere to go. No, if they want to walk away and not believe, they can do that. But I know that as they do that they’re going to be going to more complex, less natural explanations of the data. Hansen: Is it similar to the sort of argument in favor of the resurrection? The most simplest explanation is that he rose from the dead. It gets far more complex the more you disbelieve that. Williams: Yes. And I think also the evidence for the reliability of the New Testament and the evidence of the resurrection, you know, come very much together. They mutually reinforce. So the fact that you have this, you know, Jesus’ body has disappeared and also lots of different sorts of people saying that they’ve had a different experience of him, meeting him risen from the dead, those things go together with the fact that Jesus was also a remarkable teacher, that he came from a remarkable lineage, that he was born remarkably in a place where, you know, it was predicted a future ruler of Israel would be born and all these sorts of things coming together to make you say, “Here is a converging pattern on Jesus Christ as the Son of God.” This makes sense that you would have all this happening together. It doesn’t make much sense, if you try and pick them off one at a time and give separate explanations for each one of them. It’s just gonna be a lot more complex. Hansen: My guest on The Gospel Coalition Podcast has been Peter J. Williams. He is the author of Can We Trust the Gospels? He’s also Principal of Tyndale House, Cambridge, and a member of the ESV Translation Oversight Committee. Williams, thank you for your time. Williams: It’s great to be with you. All of history hangs on Jesus. It’s hard to argue with that view even if you don’t believe him. He and his message 2,000 years ago changed the world. But do we know the real Jesus? Do we know what he actually preached? Or are we chasing a shadow, an invention of later generations? 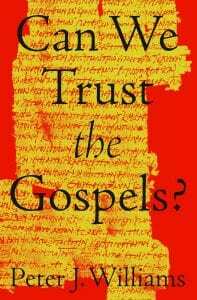 Can we trust the Gospels? That’s the question posed in the title of a new book by Peter J. Williams [read TGC’s review], principal of Tyndale House, Cambridge, one of the world’s leading institutes for biblical research. My guest on The Gospel Coalition Podcast is also the chair of the International Greek New Testament Project and a member of the ESV Translation Oversight Committee. He and I assess the best arguments against the reliability of the Gospels and seek to account for Christian faith in Jesus as portrayed by Matthew, Mark, Luke, and John. Peter J. Williams is the principal of Tyndale House, Cambridge, chair of the International Greek New Testament Project, and a member of the ESV Translation Oversight Committee. He is the author of Can We Trust the Gospels? (Crossway 2018).